La Cenerentola is an operatic Cinderella story, as told by the music of Gioachini Rossini, famed 19th century Italian composer. 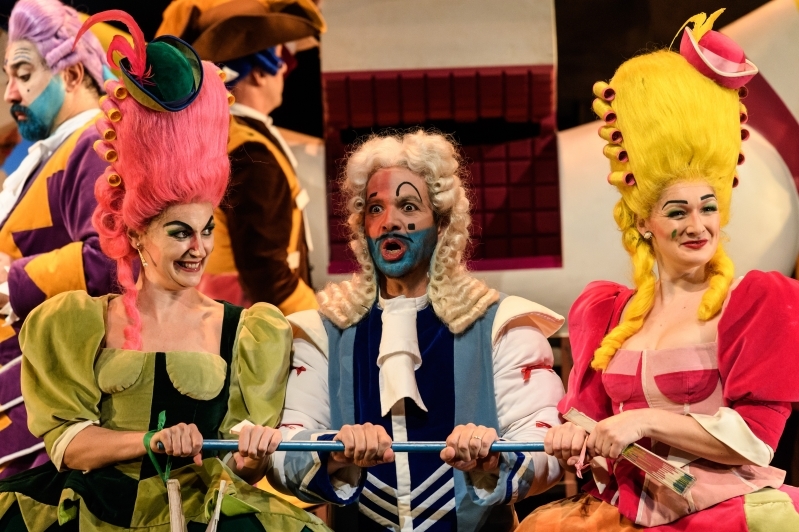 The Welsh National Opera’s La Cenerentola is layered with playful meta-humour, grand staging and a vivid colour spectrum (seemingly born in Terry Gilliam’s dreams) that drenches the costumes, hair and makeup. The tale that’s been retold again and again since its first telling in the seventeenth century is well known in the Western world. A poor orphaned girl cleans up the mess of her wicked Step-Father, Don Magnifico – the Step-Mother and Godmother are male roles in this version – and his detestable daughters. Angelina/Cinderella is the embodiment of purity, always self-effacing and humbled by her entitled family. Tara Erraught sees to this task with grace and a darling voice capable of evoking the pitying emotions her character warrants. As the narrative shuffles on after the mention of the Prince’s Ball, the vibrancy of Joan Font and Xevi Dorca’s vision illuminates the stage as the dreamscape setting of Cinderella’s journey to the ball flourishes. Though there isn’t much hint of magic or fairies in Rossini’s version, the fairy tale is apparent after this tonal shift. Beards are bright blue, beauty spots are pink diamonds and the hair is so flamboyantly tall that it’s a wonder there was no scaffolding needed. The wide stage complete with stairs and balcony is rarely sparse. There is always something worth observing wherever you look. It is an immersive sensory experience. Not least because of the omnipresent mice (dancers in costume) who act as unhidden stage hands, shifting scenery around characters mid-song with an accentuated nod, scratch or sniff. Their self-referential use brings many giggles as they cavort, cringe or roll out red carpets. From Cinderella’s resplendent white dress to the Kingsman choir and the Ugly Sister’s (Aoife Miskelly, Heather Lowe) garish get-ups, the costumes are grand pieces of clothing tailored to accentuate character. The colours and exuberance of the items cancel the drearier telling’s of the story as this expressionistic dream is so charming. It’s like Dali dressed Disney by way of Dr Caligari. When the entire cast are on stage – a pompous, humorous Dinner scene gives way to the interval – your eyes are oversaturated with vivaciousness and that’s without mentioning the scoring. Tomas Hanus utilises Rossini’s music with great aplomb. The noise rising from the pit up to the prompters on the ceiling – giving surtitles in English and Welsh – is rapturous. The music propels the story, not because most of it is sung but because the orchestra seemingly never stop. The strings are sometimes sombre and other times violent but the music wrings the sentiments from the well-worn story-beats with precision. The Chorus of Kingsmen often use their tenor and bass voices to accompany Dandini’s (Giorgio Caoduro) vaudevillian machinations, always adding depth to the songs and the stage. Casting must have been an arduous process as all characters fit into their larger-than-life roles like a mould. 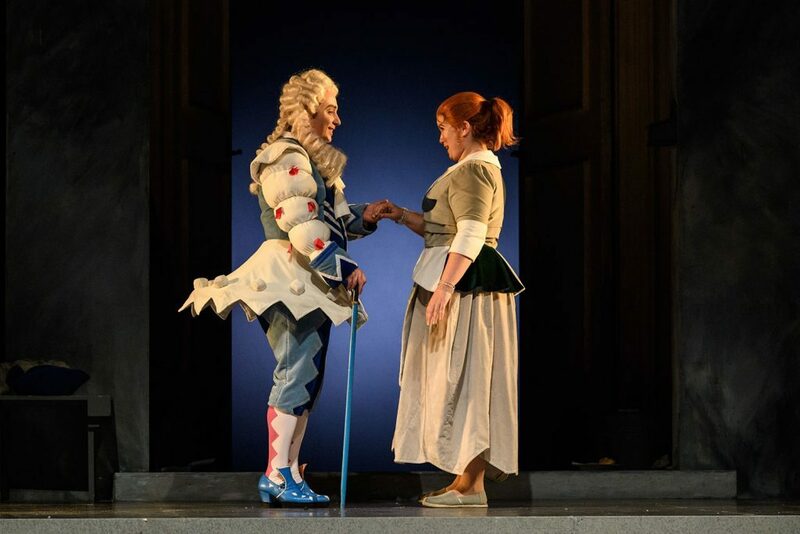 Though La Cenerentola does perhaps delve into pantomime on the odd occasion, it’s the sheer talent and commitment to the roles that maintains this as a Drama Giacoso or literally, drama with jokes. Act II does lose its propulsion and stumbles rather than sprints past the finish line. The interval could have been queued earlier, before the aforementioned Dinner scene to give Act II a propulsive set-piece to start with. But by the end, when the dream has passed and Angelina is left to sweep away the cinders that seemed celebratory in her regal romance with Don Ramiro (Matteo Macchioni), one is left in awe of the marvel of theatricality and, of the Welsh National Opera’s winning retelling of a tale where goodness triumphs and mercy is awarded. This review was first written for the Young Critics North Wales scheme which is supported by the Arts Council of Wales. More information can be found here.